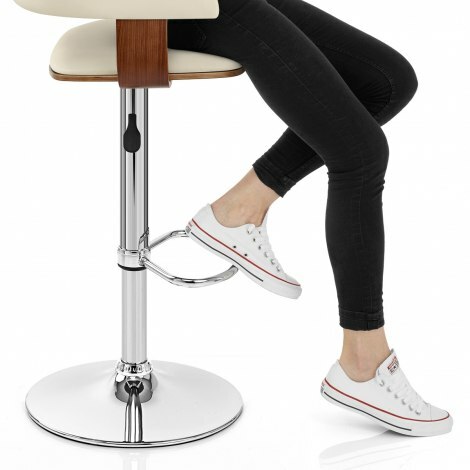 The luxurious Orlando Bar Stool Cream is now available in a fabulous walnut finish thanks to popular demand. Always one to take heed of our customers suggestions, Atlantic Shopping has remade the classic Orlando bar stool, with the wooden frame that supports the cosseting backrest now in beautiful walnut. An all-round winner that is literally made to please! Timeless cream faux leather accompanies the wooden frame for a look that will feel right at place in any location, wherever in your home that may be. Wide and accommodating, the seat is superbly comfortable and supportive. Adjustability and comfort are assured in this model, aided by the ideally placed footrest mounted on the chromed stem. This houses the variable height gas lift mechanism that also rotates 360 degrees, giving you the advantage of being able to tailor it to your kitchen or breakfast bar. The round base keeps the Orlando stable and also has a protective rubber floor guard beneath. 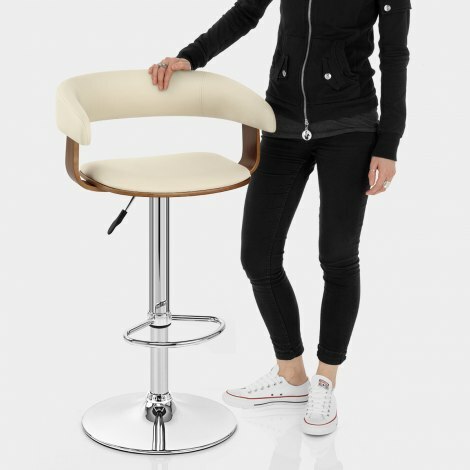 "Lovely looking stool, comfortable and reasonable price"
Delivered the next day, very easy to assemble and excellent quality for the price paid. We purchased four Orlando bar stool from Atlantic, service was excellent staff were really helpful and efficient, we would recommend to our friends and family. Quick delivery, perfect product as advertised...looks much more expensive! Have bought 4 of these and from start to finish brilliant service, quality goods and excellent price. Highly recommended.